January has been a great month so far. Launching the new website, making some good progress with networking and balancing it all out with some fun getaways! These little fun trips have given me so much advantage in terms of photo shoots at some spectacular locations along with fab summer styling ideas. I’m looking forward to share the new look book with all of you. In the meantime here’s a snapshot of a mini styling project I had fun doing, while my sister, Jayanti was visiting in November. The theme is simple really ‘monochrome refreshed with some pastel’. Black and white has been a huge trend so far and does not seem to be going away in a rush. 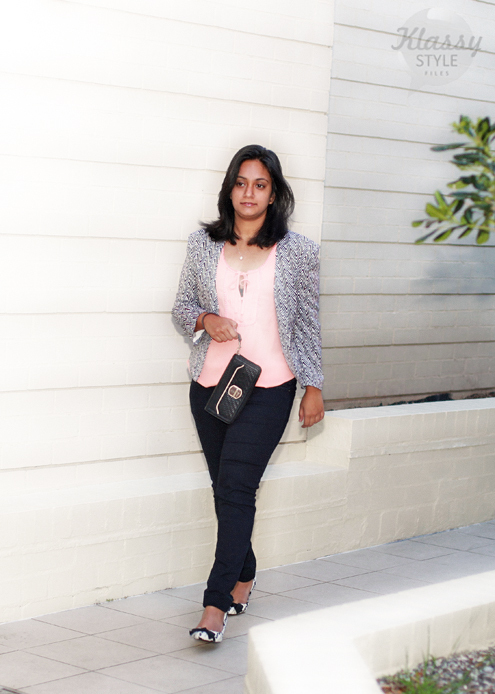 We styled some interesting budget pieces here to create a smart casual look. It can even work as a season transition look going into autumn. Although I’m not rushing to embrace Autumn just yet but as a stylist I’m learning to think a season ahead (or maybe even two!) 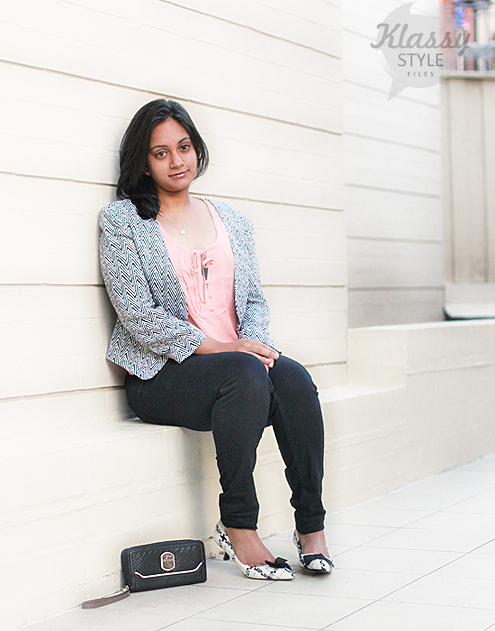 Jayanti recently sported this look at her graduation party and it was much loved! The textures and patterns are the key hi-lights of the look. Ever classy chevron meets tweed! There is hardly a need to bring out any accessories barring the delicate pendant which adds a tiny speck of desired sparkle. Do share your feed back and don’t forget to follow along on Facebook and Instagram for more style bites!! 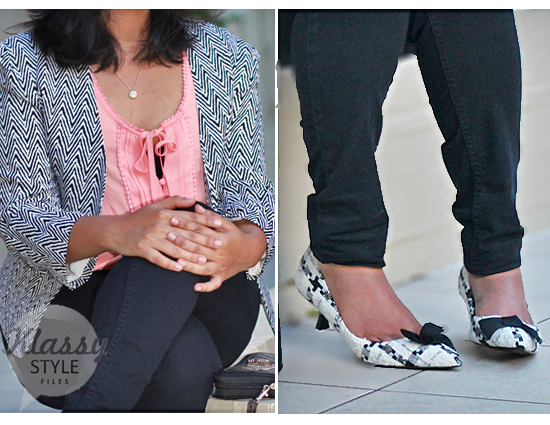 Love the jacket and those shoes Never knew how classy pastel colors would look with monochrome!! 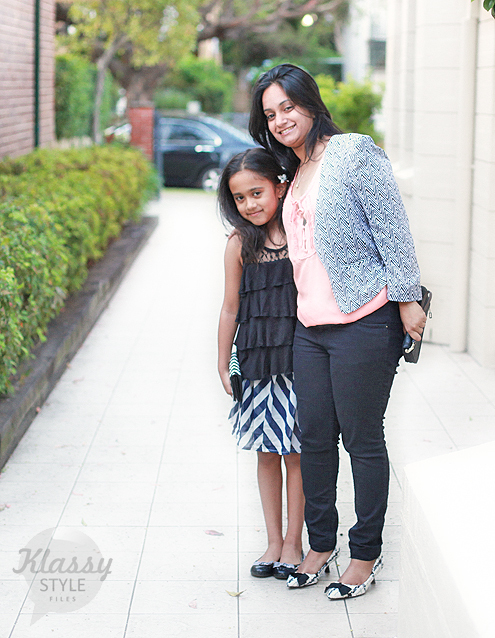 And Ananya has a clutch – adorable!! such a good job, I love ur choicest picks, u make her rock tis outfit ! Your sister look as beautiful as you and this decent styling has added much grace to whole look. Congrats on new launch of website. It’s great and easy to browse. WOW..i love it. Such simple pieces put together to create magic. I love ur daughters styling too. Really lovely! The pastel adds just the right colour to the outfit. And Ananya looks so cute!